With women only making up 28.9 per cent of on-screen roles at major sports media events, including only a 3.25 per cent representation from BAME women and 2 per cent from Asian communities (BCOMS, 2018), how can sports media improve its diversity? 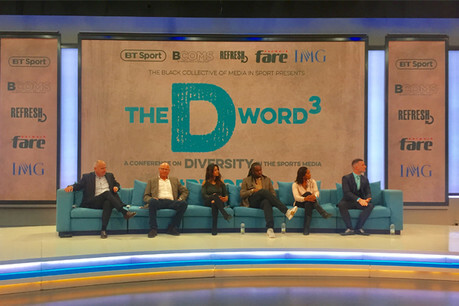 Representatives from major UK sports publications including BT Sport, The Sun, Channel 4 and Sky Sports discussed diversity initiatives at D Word 3 this week (8 October), offering potential solutions to the lack of women, and how the media organisations can prevent anti-LGBT language or behaviour in the workplace. Anne-Marie Batson, sports broadcaster, BBC 5 Live sports extra, spoke of the frustration that diversity in media is not improving quickly enough. She suggested that news organisations hold masterclasses for people that want to work both behind and in front of the camera, ensuring training goes across all ages. Perhaps, her panel suggested, UK news outlets could adopt an adaption of the 'Rooney Rule'— the NFL policy which requires a BAME application to be interviewed for senior positions. Batson noted the importance of holding pledges to account, ensuring diversity targets are measured and met. Piara Powar, executive director of the FARE Network, said young people should consider their options abroad, starting by realising that the world does not revolve around the UK — noting the amount of opportunities outside of this market. After all, monitoring the spread of media companies abroad, learning new languages and keeping an eye on where there are interesting opportunities, as well as using the British passport to their advantage, reporters can tap into many different avenues they originally did not consider. Sam Ogun, BCOMS volunteer, encouraged people from diverse backgrounds to make use of the online options at their disposal if they are struggling to break into the media sector traditionally. Panellist Felicia Pennant showed this is possible from her online work with Season Zine, a football-fashion publication, who said that while you can make your own opportunities, you still need "an idea that is strong enough and an angle that is different". Ebony Rainford-Brent, broadcaster, BBC Radio TMS, agreed. "I think we are in a space that we can be innovative, so to young people who are wanting to break in, there is a realistic message that the traditional method can still be quite hard, so make the most of YouTube, social media, create your own platform and get together with other dynamic people," she said. 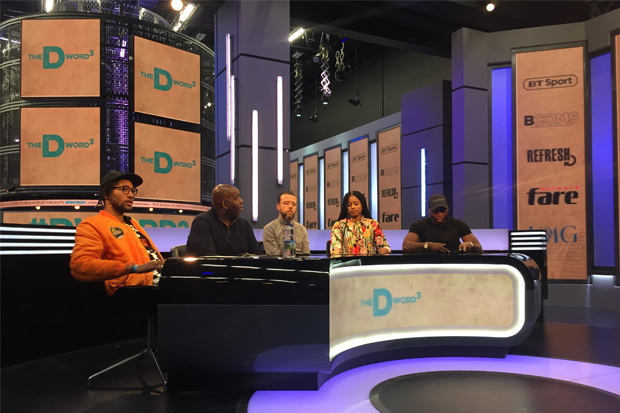 Media organisations were encouraged to take a more direct, proactive approach in sourcing young talent before they are ‘tarnished’ by negativity, instead of using well-known camera personalities and ex-athletes as ‘easy wins’ for diversity. "Every ex-player wants our jobs, and they will probably get it because of who they are," said Reshmin Chowdhury, sports presenter, BBC Sport. "We are going top-down at the moment, but we need to go bottom-up to encourage this diverse workforce from the bottom – otherwise it isn't going to happen." “For the longest time, the easiest way for a black person to get one of these roles behind-the-scenes is to go out and win an Olympic gold medal — not to study hard or get the connections,” added Stephen Lyle, head of sport, Channel 4. 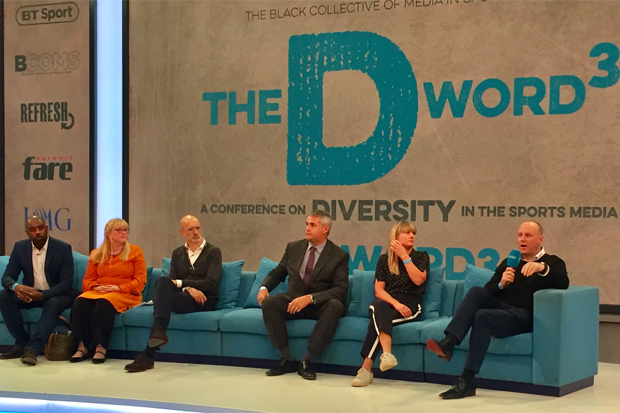 Reflecting on D Word 3, BCOMS Founder, Leon Mann, organiser of the D Word events said he felt optimistic that there is a genuine will from UK media bosses to implement schemes and encourage diversity in their news organisations and coverage. "I think we need to get to the crux of the issue, it is not easy talking about race and diversity,” he said, noting that it is important to engage both newcomers and industry veterans on diversity statistics. BCOMS will shortly be looking to release a guide that will offer 'practical measures' to sports media outlets, an will be partnering with London Sport to provide training and mentoring for young sports journalists. Get your tickets for our upcoming Newsrewired conference on November 7 at Reuters, London, where you will get a deeper dive into the digital journalism industry.